When a member of the public discovered a litter of 8-week-old kittens abandoned in a box on a garden wall, that unfortunately wasn’t the saddest part of their story – because these poor felines also had the worst flea infestation we’ve ever seen. The kittens were found without a mother or owner in sight, so the concerned member of the public gently moved them to his shed, where he kept them safe and warm with blankets and a hot water bottle whilst he contacted Mayhew. Fleas pose an incredibly high risk to young kittens, as they feed on skin and blood, resulting in severe anaemia, dehydration, skin irritation and weight-loss. All three of these kittens had pale gums, a sure sign of anaemia, and were found in a high state of distress. Their infestation was so substantial that fleas were even crawling over the kittens’ eyeballs, and they had no respite from the constant pain and itching. After the kittens arrived with us, our vets immediately set to work to treat the infestation and make them as comfortable as possible. They were first given a fast acting flea tablet that kills all insects within 15-30 mins, which was inserted in some high energy food that the kittens badly needed. We then bathed the kittens extensively in a dilute antiseptic shampoo and gave them supportive fluids, before using a flea comb to rid the fur of any fleas that had not yet been washed off. It took two vets over three hours to comb, bathe and treat the three of them, such was the extent of the infestation. Finally, each kitten was given a longer acting topical flea and worming treatment, before being settled together in a warm and cosy cabin in our Cattery. Left untreated, fleas can be fatal due to significant blood loss; and if they carry secondary parasites they can also pass on potentially deadly bacteria and infections through open wounds. To prevent the risk of your cat or kitten catching fleas, our vets recommend regular checks on both the animal and its habitat, looking in places such as garden sheds and garages where fleas are likely to breed and develop. Swift treatment if fleas are found will significantly reduce the risk to your pet and the possibility of a repeat infestation. Happily, these three kittens – named Humphrey, John and Phyllis after the siblings of the member of the public who found them – are now fully recovered, and they are all happy, playful and healthy. Their fur is fluffy and flea-free, and they will very shortly be available for adoption. 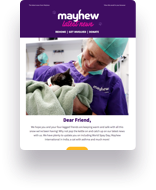 Mayhew’s Animal Welfare Officers and Vet team respond to hundreds of abandoned, neglected and abused animals every year, and provide ongoing support to carers and pet owners in vulnerable situations. Please consider a donation so we can continue our vital work helping more animals like Humphrey, John and Phyllis.